"Everyone else has a blog. We should too!" It's the phrase heard in executive boardrooms around the country. A blog is a great way to market your business, but it's important for your blog to reflect your brand. Discover six ways to make sure your blog reflects your brand. Design your blog – Although it should seem obvious, your blog should have the same look and feel as your website – the two should fit together seamlessly and flow from one area to the next. When you're designing your website, integrate your blog into the navigation, or add "latest posts" to your sidebar. Many content management systems, like WordPress, allow you to design static pages and blog post pages to fit together seamlessly. Make sure your readers can easily comment, share and subscribe, and make sure your font colors align with your brand. Determine your niche – According to some studies, there are more than 164 million blogs in the United States alone, and more than 123 million people reading blogs. With more blogs than people reading them, your blog has to stand out among others in your industry. Your first step is to think about what you'll write about – your niche. This is a main focus for your blog that can help you develop a more active audience, drive search engine traffic to your site and help strengthen your brand. This might be easy if you have a highly specialized business, but if your industry is more general – healthcare, finance and industry or sales – you'll have to use other elements to stand out. Determine how you're different, and use your blog content to showcase your differences. Show your personality – Social media has forced organizations into being more transparent than ever. Companies have to have a personality that shows through in their marketing and communications efforts. A blog is a great way to transition your company personality from short advertisement copy or newsletters to regular two-way communication with your customers. Be consistent – If you're planning to start a blog – or already have – consider the time investment you will have to make it successful. You must post high-quality content regularly to make an impact for your brand. Whether your blog is several small posts daily or an in-depth article once a week, set an editorial calendar and choose regular posting days. Your customers will learn to expect the frequency of your posts and are more likely to come back and read more. Consistency with your blog can also give you regular, fresh material to make social media fans happy as well as Google, who place a high priority on fresh, relevant content. Create great content – Readers and consumers of your brand are much more likely to come back to your blog if you're sharing great, custom content. There are hundreds of sources, from event recaps to testimonials, link "roundups" from other industry blogs to news. If you don't' have time to write posts, think about hiring a freelance blogger to search for ideas and write your posts weekly. Integrate video and photos for a multimedia element. Use Google Adwords keyword analyzer to find hot topics in your industry or trending stories that you could tie into your own brand. Set up Google alerts for keywords, locations or other information that would make a great story. Set an editorial calendar with evergreen stories that can be used anytime – this way, you can write blog posts in advance and never have to write one at the last minute. 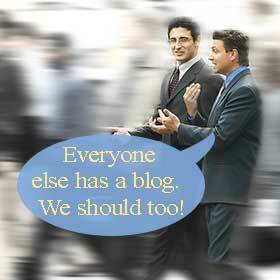 Cross promote – Guest posting is a great way to introduce your blog and brand to a new audience. Reach out to other companies in your industry who run blogs and ask if they have guest-posting spots available. Consider opening up your blog to them for cross promotion – they may be looking for new content on their blog, too.